The secrets of the witches cauldron is riddled with many strange mythos and odd opinions. There are however three points that most ponderings upon this theme has in common. One is that the cauldron is a representation of the cosmos, the second that the cauldron possess oracular powers and the third that these mysteries somehow are connected to the old witches of the land, to those witches that has passed away. The cauldron as it is known amongst most currents of witchery (at least to my cunning) is a container with little contents. It can be filled with offerings and by this act the spirits of the old witches of the land can be moved by the sacrificial tokens both by word of deed and acts of reverence. In this sense the cauldron can serve as both a foci for the radiation worked up by the covines and as a point of attraction for the old dead witches. But there is another kind of cauldron existing, a tradition that seems to have been largely lost amongst us, these secrets are still existing, especially in south western Africa, Brazil and the Caribbean islands like Curacao, Hispania and Cuba. In the Congo region of Africa a rich sorcery based religion is still vivid and alive. It is known as Bantu Ewe. During the slave-trade the various strands of African nations was sent to different places like Brazil, Cuba, Haiti. The result is this magnetic and fertile conglomerate of violent, fiery and seductive religions and traditions using ecstatic and oracular means to achieve communion with the divine. The Bantu Ewe religions when it travelled to Brazil was merged with other currents, but the essence remains and is known as Quimbanda, when it travelled to Haiti and Cuba it received the name Palo Mayombe or Palo Monte. Palo Mayombe has received a lot of negative publicity especially through the misleading and quite unintelligible books by Migene Gonzales Wippler who is responsible for inducing Seekers with inaccurate and too often false and misleading information based upon her own misguiding by santeros and paleros. Especially her exploration of Palo Mayombe is soaked in bewilderment and falsity. Further we have incidents like the killings in Matamoros on the border of Mexico approx. 14 years ago where a small cartel of drug-dealers sacrificed humans to gain money and power. They said they were paleros. The movie Peredita Durango is loosely based upon such a character and is again misleading and hooks into fairytale and is at its best amusing not the least because the “evil palero” in the movie, in addition to being evil has a ridiculously bad haircut that makes him look a bit retarded. Not a good testament for a serious tradition of sorcery. 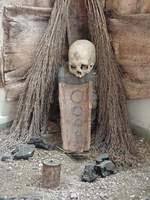 Palo Mayombe is not only a very serious tradition of sorcery it very well be that it is the one tradition that has preserved the original secret of the cauldron most intact. Palo is mainly focused upon the cauldron and its contents. And as any serious tradition there are secrets connected to it that should not and will not be divulged. There has however been written so much about what the famed “prenda” or cauldron is and what one is able to do with it that a serious exploration of a serious tradition is in order. The origin of Palo Mayombe is to be found in the Congo area and even thou Mayombe is the name of a district in Congo this term has been attached to the many forms pf sorcery coming from this region amongst the tribes known as Bantu Ewe. Of these there are an almost infinite array of smaller and larger groups that has in various formats travelled to the Caribbean islands. Ngola, Aqbakua, Kimbundo, Muluande, Mumbata, Masinga, Loenga, Pongue, Kimbisa and many others. Naturally this wide array of different conclaves of spiritual disciplines results in a wide variety and even if lines and threads are crossed and shared there is highly distinct and different praxes within each “rama” as it is known. A “rama” signifies the initiatic line of each tradition. Rama can loosely de understood as “the tradition of an order”. Some say that there are 7 branches of Palo, others that there is 21. I don’t think one can say any exact figure, but instead we can rely on the fact that the Kimbisa order is amongst the more ancient of the ramas of Palo as it also has given birth to a wide array of other ramas as well as it has reformed it self in syncretistic manner. The origin of the Kimbisa order is of great importance for the heterodoxy along cultural lines when it comes to the prior racial resistance amongst black paleros. With the Kimbisa order the first non-black man was received into this mysteries and his name was Andres Petit in the 16th century. Petit cultivated the order known as “santo christo of the good journey”, perhaps the most known of all the branches of Palo. From the Kimbisa order the Malongo order, the Shangani and Vence Batalla are also developed. A lot of evidence points to the fact that the first prenda to arrive to Cuba was a Kimbisa-prenda, making this branch the root of all the other ramas. Palo Mayombe is first and foremost a secret cult of the Dead. Its main focus is what is known as the prenda or nganga. This is the tool of the sorcerer, his or her connection to his spirit allies and the gods of the tradition and even more important the actual essence of nfumbe or a particular named dead person. There has been much mystique around the construction of the prenda. The procedure is as complex as it is simple. First of all one has to be initiated into this tradition and after initiation it will take time before one receives a prenda. And you have to have received a prenda from ones godfather or godmother before making another prenda. Only guided by the prenda of a priest or a priestess can another prenda be born. These attempts seen on the internet on buying certain kinds of “build-your-own-prenda” is at its best effect a waste of money and at its worst, an invitation to raw elemental forces to feed upon you. There are many secrets that goes within the prenda, but basically the ingredients you need are a cauldron with three legs, in some cases a cauldron of copper and in other instances one of clay. The custom in Congo is to birth the prendas in clay-cauldrons. The cauldron are then washed with sacred and empowered herbs. In the cauldron one needs different kind of dirt and earths, metal of different kinds, wooden sticks, what is known as palos, of different kinds and numbers and most important the bones of the dead. There are ramas, such as the Shamalongos that work Palo Mayombe in a strict spiritistic fashion and is not using the bones of the dead. Through divination the vibration of the ngueyo (the one who is going to be initiated) are decided through divination, the tools for divination can either be the use of shamalongos (coco), 9 or 16 cowries known as Nkobo Vittiti or by possession. The gods and goddesses of the Bantu Ewes are called nkisi and a prenda is working on the premises that a contract is made with the living blood of the dead bones, so to speak and its direction or flavour is decided upon by the nkisi that is presiding over the prenda. When you receive a prenda the prenda is unique and no one is exactly alike, but the name of the prenda is almost always flavoured after a nkisis. The name of the nfumbe within the prenda should not be disclosed to anyone and is the secret of the priest (Tata) or priestess (Yaya) of Palo. Through the act of rayamento or initiation and the presentation to the manifest natural principles of nature and other points of power such as the ocean, lakes, woods, mountains, cemetery and such the blood-pact is made between the ngueyo and the realm of the Dead. The rayamento is painful as it induces on the ngueyo pain both by fire and actual cutting of the flesh. A blood-pact is made and the old saying goes, “A palero is born by fire and shall die by fire”. Or as the saying in Kimbisa Ntoto of Puerto Rico, “Learned Old Men hits Hard”. The prenda is known as FUNDAMENTO, the foundation and the treasure of the palero or palera. It is the beginning and the end of all and the contents in the cauldron reflect the total array of cosmic manifestations. The nkisi is also, like the Loa of Haiti and the orisha of Yoruba associated with natural principles and natural manifestations, like rivers, oceans, wind, the market, the cemetery and the like. Whether this pact between the palero and the nufmbe is constituted by force and threats or more friendly methods differ. In some ramas the importance is great on the fact that one should act like the nfumbes master, in others as the nfumbes provider and friend so one enters into an understanding relationship. The dead are not stupid and the brain-dead movements known by the exploration of zombeeism in Hollywood-movies is far from accurate when it comes to dealings with the dead. In my opinion a fatal grip is to act like you think the nfumbe is stupid, instead of a relationship tied with a strong bond you will have invited in your home a rather annoying guest. Through the nfumbe you will suddenly have access to the realm of old dead witches. Through mediumship, spiritism and possession one can enter into contact with these old witches or one can through constant work with ones prenda work in more silent manner and develop ones sensitivity for the variety of vibrations that are oozing forth like blast of fire from the Kingdom of the Dead Witches. Also the actual marking on the body and the blood that ties you to the earth is connecting you to the living blood of the dead bones. Oracular praxes is made possible due to the fact that a prenda is working because it is ruled by a spirit with insight into the realm of Dead and by a divinity that is existing within the waves of time and action in the natural unfolding leap of time. As mentioned divination can be performed wither through possession, mainly this is done with inviting the especially spirit protector of the palero to enter the body-mind of the palero and to ride his body and consciousness. These divinations has a tendency to by shockingly accurate, but also quite humorous. Many dead spirits has captured a surprisingly amount of good and high spirit presented in strange comments and odd gestures. Another method is the use of the nine shells, nkobos. The pattern of how they fall is interpreted and these throws also disclose which nkisi that are speaking and which energies and influences that are currently moving the life and conditions of the client. One can also use four bits of coco-shell, mainly used to ask about matters that can be disclosed with yes and no-answers. In the rama of Shangani, Vence Batalla and Viramundo which are the tradition the undersign is most familiar with the use of shamalongo are the most used together with possession. Palo Mayombe is a tradition that works with the most brute and raw forces of the universe. The nkisi seems to be less refined than orishas, the gods of Yoruban-derived modes of worship. The nkisis is equally and fundamentally fused with nsasi and ndoki, with divine light and darkness, and this mixture is remarkably evident in the tradition. Palo Mayombe is a tradition of sorcery both simple and complex. Simple because you really don’t have to do much else than related to the nfumbe in either manner to get your will and desire executed, at the same time the way that leads to this pact with the dead is both strange, demanding and painful. To be safely introduced to these forces of the Old Light one must be patient and the importance of working under the enlightened eyes and caring hands of a trustworthy godfather can not be stressed enough. Palo Mayombe is the raw and direct path to the Old Light and once retrieved it wont let you go. Nsala Malecum!